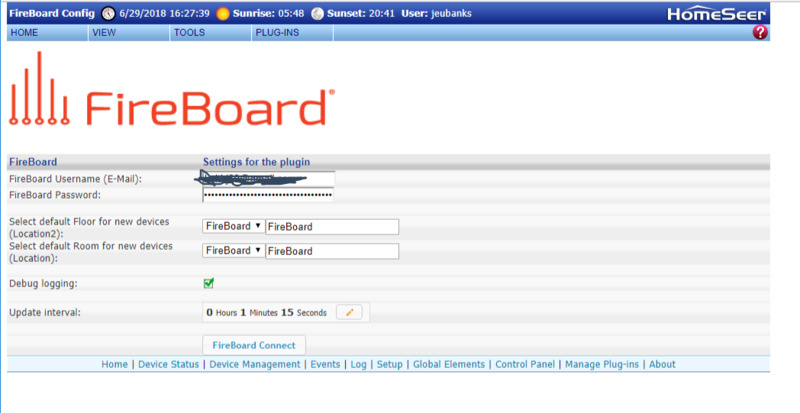 I have began working on a FireBoard plugin. Feature requests or information presentation requests can be made to this thread. Beta's and relevant information will be released to this thread as development progresses. This is the initial public release. Installation is typical for manual distribution of Plugins. After start the plugin will be waiting for login information. Go to the Plugin Config page and enter your username and password for the FireBoard.io site. Once done click the FireBoard Connect button. The FireBoard devices will be created in the Locations you selected and will begin updating based on the interval you chose. The default update interval is 1 minute. Last edited by Simplex Technology; July 4th, 2018, 11:16 AM. I'll start with my wish list. 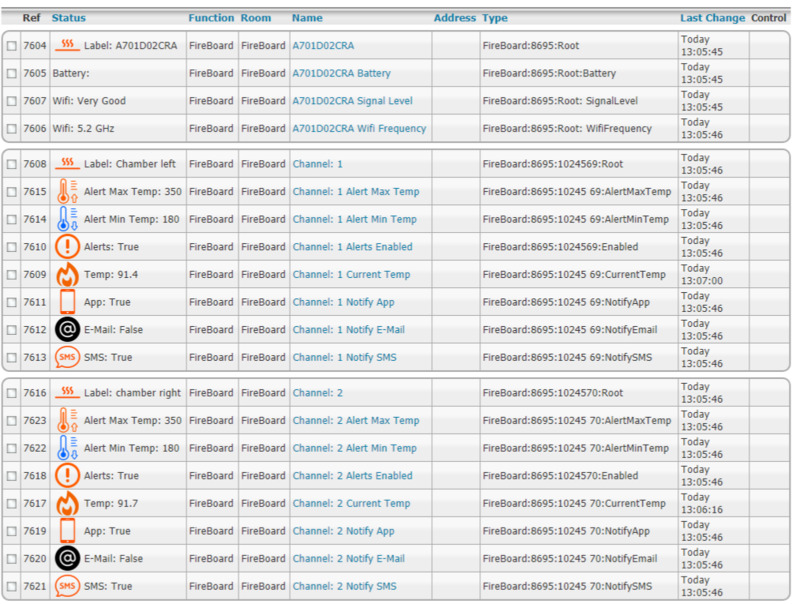 Being able to have events based on temp per channel. Being able to see the min/max temp threshold per channel. After 6 hours and many beers later, it's easy to forget. Being able to see a reading on wifi strength. And whatever else I already said. It may take a cook or 2 to figure everything out. Here's what I'm thinking of options for structure. Thoughts/Opinions? 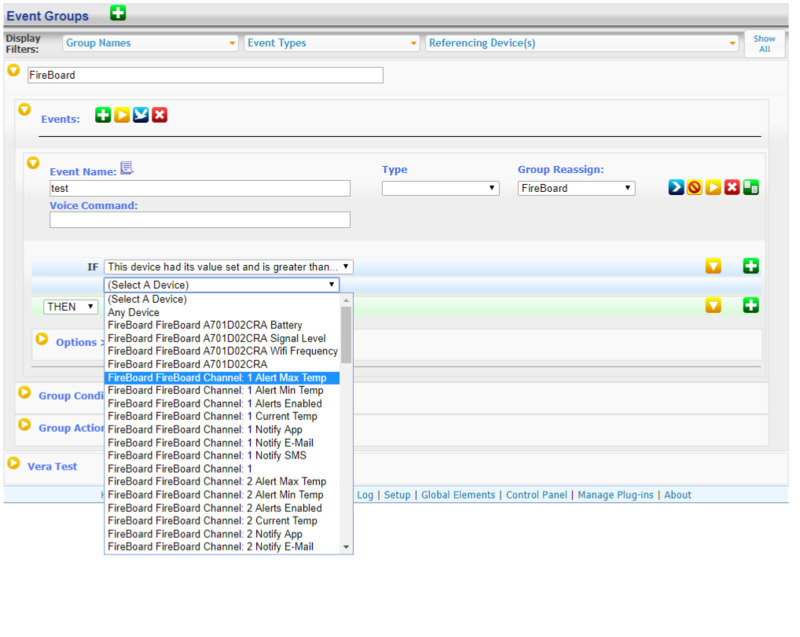 Single Root for the Fireboard and each channel and channel parameter a child of the same root? Single root for the Fireboard device and separate root for each channel? Group Channel as root device and parameters of it as children? With this approach the initial "names" of devices will be the same. Set them with a distinct "label" of the FB device name as prefix until renamed? looking at the json, the min/max/average is just history stuff. 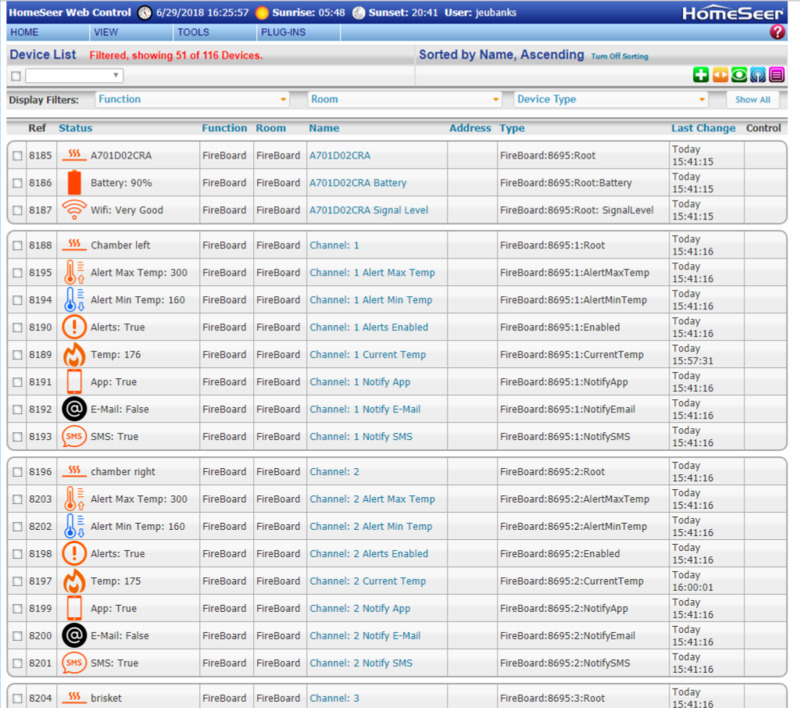 if you drop down on alerts the temp_max and temp_min would be of interest. edit: As for the structure, I do not know enough about HS to say what is a good idea or a bad idea. I can drop the min/max/avg as I don't think they're useful either, but didn't want to exclude if somebody wanted them. Can always add back later. I hadn't thought about speaking the probe name. That is excellent. I suspect that it could at least renamed in hs and called by $$dvr type name. Since you use a fireboard, do you think having the ability to have more than one fireboard is needed? That could sway how the PI is developed. I only plan on one fireboard for myself for now-but multiples could be possible in the future. Probe and session names can change with each session, so if there is a way to read that and reflect it in the each probe device string status and session device string status that would make it much easier to make events once that always work. Not sure what is possible with the api. I just looked at the webpage and app and do not see battery levels being reported. It would be nice to have the ability to have an event based on the battery. Or at least shown. If the battery really does last close to 24 hours it isn't a huge deal, but it would be nice. I'll know if it last that long within the next 22 hours. I like what I see. Off the top of my head, I can't think of any other info that would be needed. I notice 2 empty fields, one is battery and the other is temp, any reason for it to be empty? If you switch to matrix view in a browser, and you edit the alarms to change the min or max, will that get pulled across into the PI? 2. There are 2 batt items in the JSON dump. 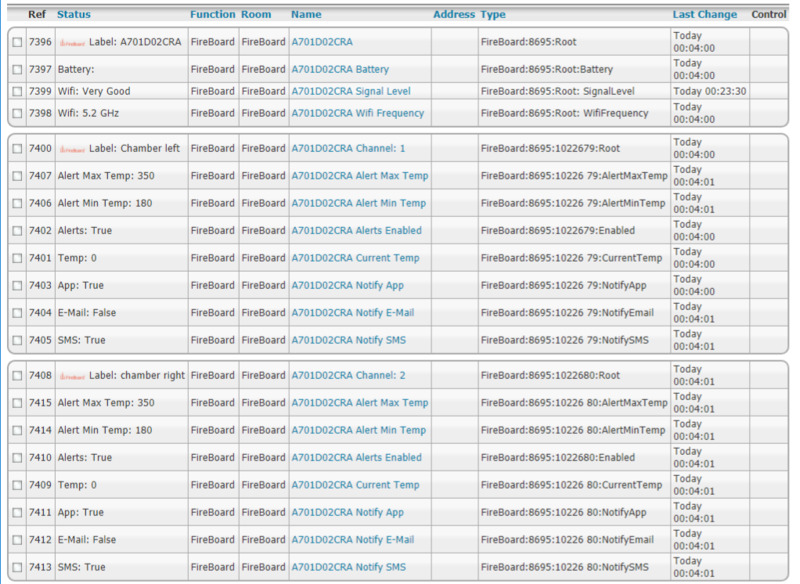 I've contacted FireBoard to find out which is the correct one to use and what the range of the readings are. Yes the Alert Min/Max are pulled from the alert settings from the website. If you update them from the app/web the PI will update. 1. Oops. I reset it this am... it may have started a new session. 2. Cool thanks for the answer. edit. I wonder if the disconnect issue is a bug. I looked after the disconnect and it showed up in the app/site. And the odd thing is only one probe was disconnected. The only other thing that happened when the probe came unplugged was me taking it off of power and letting it switch over to battery. Here's some more eye-candy of the current progress. Very nice. I can't wait to stress test this.